Cuisinart, a name that purely belongs to kitchen appliances. It can be seen as a food processor, a microwave, a hand blender or anything that you can think about in the kitchen. The brand has a history of making quality kitchen appliances that are both affordable and durable for a common consumer. Here we will be talking about the top notch coffee makers by Cuisinart that are already quality rated by consumers and are sold the most. The units mentioned above are the golden eggs by the brand and are doing exceptionally well from long time. The team has kept these coffee makers updated with the current trends that makes them future proof. At No.1 position is the Cuisinart DCC-1200 which has over 4500 positive reviews on Amazon. It clearly states as how the product is. The DCC-1200 is an ideal drip coffee maker that includes all the basic functions required. No more hiccups and extra buttons to confuse. Cuisinart Brew Central is an old brewer that has given a great cup of coffee every morning and continues to do so. There are a few options in color to choose from to suit your preference. The control panel is easy to understand and there is not much clutter of buttons and there only the required functions. The programmable feature allows us to wake with an already brewed cup of coffee. At the second position is the DCC-1100BK model that can be either opted in black or white color and also gives the flexibility to choose from 10 or 12 cup capacity. The design depicts a simple elegant look with a little ascent of brushed metal look. The DCC -1100BK has a little smaller footprint on the platform as compared to the DCC-1200 and can be said as the younger brother. The only major difference between the two is the warming plate. The temperature is not adjustable in the 1100BK model. All the other features are same and this is also the most selling product of Cuisinart. Another model that is a hot cake is the DCC-3000. It has great design and it looks somewhat like a premium coffee maker. The front visible design of tank and stylish coffee gauge gives it an attractive look. The other feature that makes this coffee maker so successful is the ability to dispense just one cup at one go. There is a lever in front that does this job. This is a premium looking coffee maker if you in search for some modernistic design. It also brews a great cups as other Cuisinart except the functionality is changed in this. It dispenses single cup at a time and a travel insulated mug is included. Moreover, the visible water tank clearly tells as how much water is left and the coffee gauge states as how much brewed coffee is left. Now this brewer adds the functionality of hot water output so you can make tea, soup and more with this appliance. With this added function, it does takes some extra space but if you often have a requirement of hot water, opt this. This coffee maker is sold at good quantity which is depicted by more than 2000 ratings on Amazon. All in all, it’s a great buy if you need the extra hot water functionality. The basic features are same as the other Cuisinart brewers, it just takes some extra space for the added feature. Also note that the hot water function and the reservoir for brewer have separate tanks. Everything is similar to other Cuisinart brewers except it’s a complete package with a few more added buttons. In this coffee maker, one can control the brew strength as ‘regular’ or ‘bold’. The looks are majorly occupied with the brushed stainless steel material which looks classy. The added grinder is an advantage with this machine and saves the cost and space for an extra appliance. Though the grinder has no controls, it is only for the basic coffee drinkers who just know that it can grind beans and are not interested in knowing how it grinds. 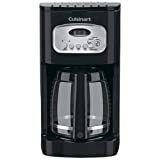 Overall, it was great writing about the best selling Cuisinart coffee maker. The brand is also specialized in the production of Grind and Brew coffee makers and has the most options to choose from. Many of the functions among the above coffee makers are same as they are from the same brand and the major difference between all is brewing size and minor functionalities. We have only included here the best selling ones and you can opt for any that you like.